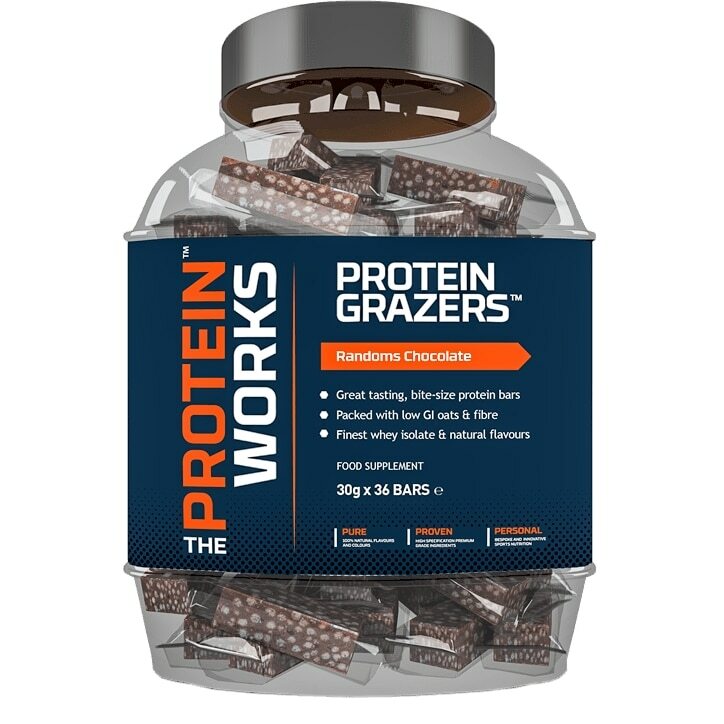 PROTEIN GRAZER™ protein bars from THE PROTEIN WORKS™ are convenient bite-size high protein bars packed full of the finest quality whey protein isolate and oats. Engineered using TPW™ natural flavours and colours, each Protein Grazer™ bar is individually wrapped for extra freshness. They are a great tasting snack to consume in between meals or any time of day. Each Protein Grazer™ bar is high in protein to boost your protein intake to help keep hunger at bay. Whether on your desk at work or in your kitchen cupboard at home, you might want to consider keeping your Protein Grazer™ bars safely under lock and key! We appreciate some of you like to mix things up a bit and we completely get there's nothing like being different. So much so that we've created a range of RANDOMS which include a mix of flavours so when you dip in, you never quite know what you just might get. Science Behind Protein Grazers™ Protein Grazer™ protein bars are formulated using premium grade whey protein isolate which helps ensure your body receives the highest biological available protein. Protein Grazers™ - Protein Bars For All Goals One reason Protein Grazers™ are so popular is because they have been specifically created to be as nutritionally versatile as possible. Whatever your goal, Protein Grazers™ can be a positive addition to your supplement and diet. As with all TPW™ products, these innovative bite size protein bars use only natural ingredients to create an exceptional tasting snack. We believe the finest ingredients deliver the best results. Innovation in Protein Bars Unlike most protein bars on the market today, which have been extruded through high pressure machines in the production process, Protein Grazers™ are baked. This gives them a better texture. The inclusion of whey isolate crisps and the tri-oat blend add a further dimension to the texture and we believe sets Protein Grazers™ apart. The baking process also gives the protein bars a more intense and natural flavour which all helps when you need to satisfy cravings, without sacrificing your diet. Consume our protein grazers any time of the day as a high protein snack to boost your protein intake and keep hunger at bay. Rocky Road -Whey Protein Blend (27%)(Whey Protein Isolate (Milk), Whey Protein Crisp (Whey Protein Isolate, Rice Flour, (Milk), Emulsifier (Soya lecithin)), Oat Blend (21%)(Wholegrain Oat Flakes, Malt Extract (from Barley), Palm Oil, Oats (Gluten)), Glucose Syrup (Wheat), Humectant (Vegetable glycerol), Fructo-Oligosaccharide, Dark chocolate chunks (4%)(Cocoa Mass, Sugar, Emulsifier (Soya lecithin), Vanilla extract, Fat reduced cocoa powder (3%), Rapeseed oil, Glace Cherries (2%), Cherries, Glucose-Fructose Syrup, Sucrose, Preservatives (Potassium Sorbate, Sulphar Dioxide) Citric Acid, Colour (Erythrosine)), Marshmallows (contains Gelatine), Natural Flavouring, Sweetener (Sucralose). Chocolate Coconut: Whey protein Blend (27%)(Whey Protein Isolate (Milk), whey Protein Crisp (Whey Protein Isolate, Rice Flour, (Milk), Emulsifier (Soya lecithin)), Oat Blend (21%)(Wholegrain Oat flakes, Malt extract (from Barley), Palm Oil, oats (Gluten)), Glucose Syrup (Wheat), Humectant (Vegetable glycerol), Fructo-Oligosaccharide, Dark chocolate chunks (4%)(Cocoa Mass, Sugar, Emulsifier (Soya lecithin), Vanilla extract, Fat reduced cocoa powder (3%), Rapeseed oil, Desicated coconut, Natural Flavouring, Sweetener (Sucralose) Natural Flavouring, Sweetener (Sucralose).